Based on the Giller Prize-winning novel. “Don McKellar and his marquee cast — featuring Tantoo Cardinal, Brandon Oakes, Graham Greene and a dazzling Tanaya Beatty in the lead — explore the way a young Cree woman’s disappearance traumatizes her family and triggers events in two worlds: in Moosonee, the remote Northern Ontario community she fled years ago, and Toronto, where she modelled before vanishing. 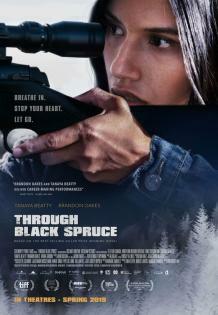 “The smart, heartfelt Through Black Spruce follows Annie Bird (Tanaya Beatty), a Cree woman from James Bay, as she travels to Toronto to find her sister, Suzanne, who left the family home in Moosonee more than a year ago — and hasn't been heard from since.